While they might seem like utilitarian fixtures, garage doors are a vital part of your home, taking up a large portion of a home’s facade and commanding more attention than you might imagine. In that case, garage door replacement should be an important part of your remodeling plan. Garage door replacement will not only instantly improve your home's curb appeal, but can also increase your home’s value for relatively little cost. To complete garage door replacement safely and efficiently, it's always recommended that you hire a contractor to help. However, it also helps to know what to expect before beginning the process, so take a look at our guide to garage door replacement to better understand the process. First, choose your style and material. It's important for your door to match the overall style of your home. If you live in a laid-back bungalow, for instance, sleek, modernist doors might not be the best fit. Second, consider how you want your door to open. Tilt-up doors consist of a single panel that tilts out and up. Sectional doors are composed of many panels held together with hinges, so they roll backwards as they retract, rather than swinging outwards. Finally, choose the material you want to work with. Some popular materials include wood, aluminum, or steel. Wood is always a classic choice and finishes fantastically, although you’ll need to repaint or re-stain wooden doors frequently. Aluminum offers a less expensive alternative to wood, although without the classic style wood provides. Finally, steel is fairly inexpensive and sturdy, although it tends to scratch, dent, or rust if not properly maintained. When navigating a garage door replacement project, you'll need to choose the type of construction you want. While every manufacturer has its own unique style, you should be familiar with a few main construction techniques: single layer, which uses a simple layer of one kind of material, such as steel; double layer, which features both an inner and an outer layer; and premium, which combines the inner and outer skins of a double layer with premium insulation values. 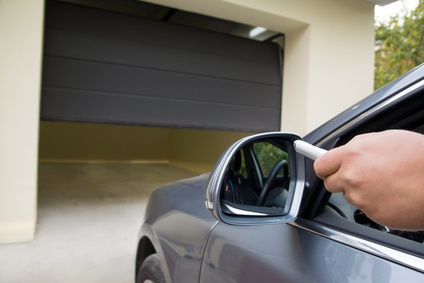 When considering garage door replacement, don’t forget about the bells and whistles! For example, consider what the different kind of springs available, and which ones might be best for your home. Extension springs are great for tilt-up garage doors, while torsion springs work better for sectional doors. Also, consider whether or not you want to install convenient additions like automatic openers, or aesthetic features like decorative windows. Unlike your standard interior installation, garage door replacement tends to be a daunting task, partly because the door is so large. As such, it can be very dangerous to attempt a garage door replacement project on your own. It's best to hire a contractor who can help you. This will add a couple hundred dollars onto the final tab, but the work will be done more quickly, safely, and efficiently than if you attempt the project on your own. If you’re ready to move forward with a garage door replacement project, check out our helpful database of contractors to find the best home improvement professionals in your region.